Born in Nebraska in 1937, Ed Ruscha grew up in the mid-west city of Oklahoma. 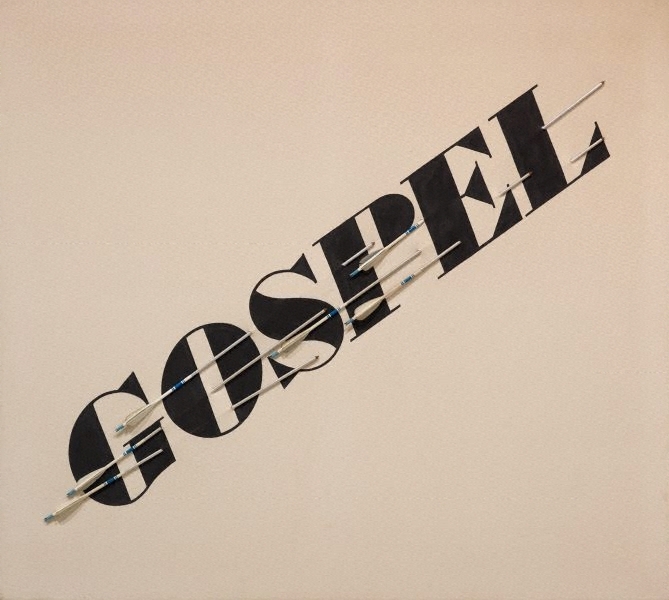 Following an early interest in cartooning, Ruscha pursued a career in commercial art, heading west to Los Angeles to enrol at the Chouinard Art Institute in 1956. During this period of study he also undertook a short apprenticeship in type-setting and at the completion of his studies in 1960 worked as a graphic artist in an advertising agency. Exposed to and encouraged by the work of Jasper Johns, Robert Rauschenberg and Roy Lichtenstein, Ruscha dedicated himself to painting. In 1962 his work featured alongside that of Andy Warhol and Lichtenstein in ‘New painting of common objects’ a survey show that captured the emergence of the pop art scene. Ruscha’s use of text is iconic. As theorist W.S. Di Piero has noted, Ruscha exploited ‘Words as pop artefacts’ that ‘dressed geometric severities in painterly enthusiasm. Here the word ‘Gospel’ hovers between the sublime and the mundane, evoking both the everyday reality of a church-going American populace, and at the same time drawing upon its inherent reference to the divinity of text. At once subtle and provocative, Ruscha has painted this word in a clean style reminiscent of sign-writing and billboard advertising. He has then pierced the raw canvas with metal arrows, introducing an element of assemblage that alters our reading of the text itself. Signed and dated u.r. verso, black fibre-tipped pen "Ed Ruscha/ 1972". Kristine McKenna, Los Angeles Times Calender , 'Lightening Up the Getty', pg.5, Chicago, 1998, 5 (colour illus.). Justin Paton, Pop to popism , A divided consciousness: pop art after 1968, pg.187-231, Sydney, 2014, 212, 213 (colour illus.). Edward Ruscha, Edward Ruscha: catalogue raisonné of the paintings , New York, 2003, 48, 49 (colour illus.). David Rush, Artweek , 'Visual and verbal', pg.1, Oakland, 1975, 1 (illus.). Look , 'Director's choice', pg.15, Sydney, Jun 2013, 15 (colour illus. ).